Flynn, Py & Kruse is a general practice, full-service law firm serving northern Ohio. Founded in 1875, the firm has earned a strong reputation throughout the state for providing effective representation and quality legal solutions. The firm's strengths include a multidisciplinary approach, strong advocacy skills, a sophisticated understanding of the legal and business environment in the region and the provision of responsive client service. Major practice areas include business law, civil litigation, and estate planning and probate. 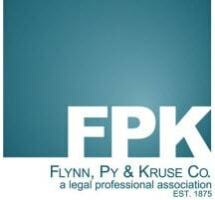 But as a general practice law firm, Flynn, Py & Kruse is prepared to address virtually any legal matter that may arise. When clients retain the firm, they can be assured Flynn, Py & Kruse will do everything it can to achieve positive results in a timely and efficient maner. Over the years, some of the most well-known legal names in the region have served as partners of Flynn, Py & Kruse. The firm's attorneys and staff have built a dynamic law firm on this legacy, employing sophisticated legal strategies, solving complex problems and responding promptly to clients' needs. For service based on traditional values and contemporary thinking, turn to Flynn, Py & Kruse. To schedule a consultation with a lawyer in the firm's Sandusky or Port Clinton offices, call Flynn Py & Kruse at 419-625-8324.